For a long time the Arctic region has been viewed as barren wasteland far from civilization due to its inaccessibility arising from layers of thick ice. As a consequence, territorial claims have been relatively limited. Today the situation is different. The recent Arctic melt (said to have reduced the sea ice by as much as 50% compared to the 1950s, according to the U.S. National Snow & Ice Data Center) and the rapid development of transport and exploitation technologies make the Arctic region more accessible than ever. This, in turn, has led to a new scramble for territory and resources among five Arctic States, namely Canada, Denmark, Norway, Russia and the U.S.. They are rushing to claim undeveloped and, in some cases, unseen territory in order to exploit natural resources estimated to be worth hundreds of billions of dollars. 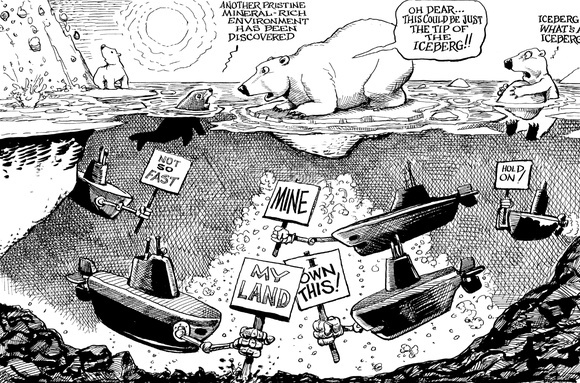 Although detailed and reliable scientific data on what lies under the Arctic Ocean is still rare, the U.S. Geological Survey estimates the mineral deposits in the Arctic seabed to hold 22% of all undiscovered, technically recoverable oil and natural gas resources in the world. In addition, experts also highlight the value of other resources such as coal, iron or copper that may lie in abundance. But, considering that an Arctic-specific legal regime is lacking, potential new access to the Arctic does not only open up new oppor- tunities for exploitation, but also for heated territorial disputes concerning the question: who owns the Arctic and is therefore entitled to the resources in the Arctic seabed? On 2nd August 2007, after returning from an expedition that culminated in planting a titanium Russian flag on the seabed 4261 metres under the geographical north pole, the Russian polar explorer Artur Chilingarov claimed that, “the Arctic is Russian” and “has always been Russian”. However, from the standpoint of international law this act was purely political and had no effect on the legal status of the Arctic seabed. Nevertheless, the gesture of flag planting captured the world’s attention and revived speculation about a possible military confrontation in the Arctic. However, the Arctic as a potential battlefield for an “Ice Cold War” is an unlikely scenario to prove true. For example, on 28th May 2008, the Arctic States adopted the socalled “Ilulissat Declaration” and committed themselves to an “orderly settlement of any possible overlapping claims” within the existing framework of international law. What guidance, in reality, can international law provide here? Since the Arctic mostly consists of frozen water and (unlike its southern counterpart, the Antarctic) not land territory, the United Nations Convention on the Law of the Sea (UNCLOS), the current international legal framework for the world’s oceans, is the decisive legal instrument. UNCLOS, which entered into force in 1994, divides the sea into various legal zones measured from the relevant coastal State’s baseline (also described as the low-water line along the coast) with the State’s sovereignty decreasing with increasing distance from the coast. To read the entire report, order a copy of the magazine.